Nothing is impossible when you have the creator of the universe backing you! This is the lesson that Paul learnt and shared with the rest of the believers. The verses prior to this one indicate that he had gone through a series of ‘ups’ and ‘downs’. How did he survive? By relying on Christ! ‘I can do all things through Christ who strengthens me. 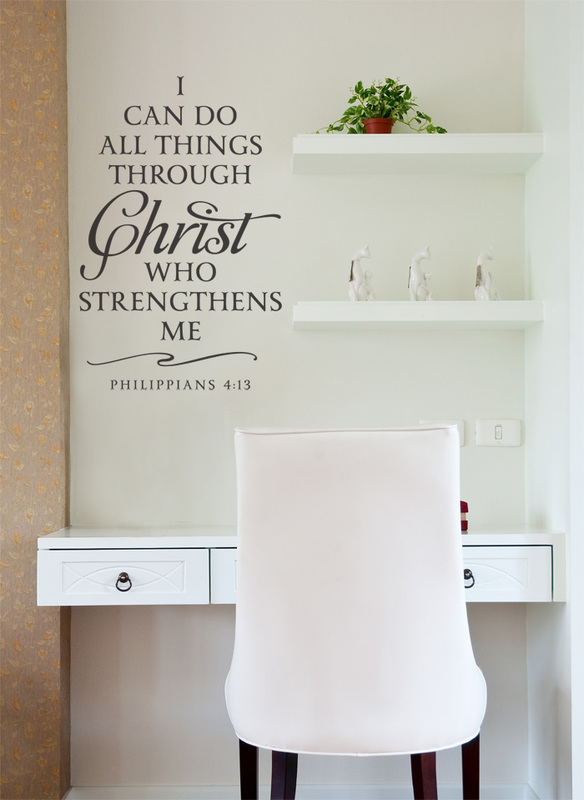 Philippians 4:13’ wall words look great in this study area! They were applied on the wall next to a display shelf which can also hold books. They contrast well with the underlying wall. They blend in with the rest of the furniture in the room. Having a hard time studying: you need these wall letters! 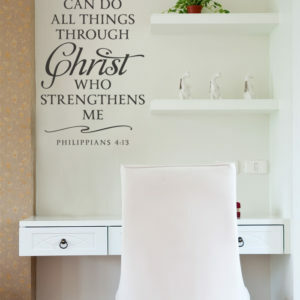 Are you looking for unique scripture wall decor for your room? Try DecorativeLettering wall quotes. They are affordable and will last a long time. This is because they are made from resin and can resist extreme temperatures: hot and cold! They do look painted: they have no clear film around them. DecorativeLettering has been in business since 2003: you are assured of high quality and creative wall decals. If you refer a friend, they will get 10% off on their first purchase. You too will earn points on this purchase: now that is a deal! Do call or email: we have a talented team of designers ready to help you decorate!